I get so tired of people discriminating against what they know as "Pit Bull" dogs. In my time as an animal shelter volunteer I came across so many loving Pit Bulls. It broke my heart when people would pass over a dog if their Kennel Card said "Pit Bull/Mix" simply because they were afraid of that name, Pit Bull. There is some debate about exactly which breeds comprise the designation of Pit Bull. It seems to me that virtually any dog with a square looking head and muscular body is assumed to be a Pit Bull! Awhile back, I won a terrific book about Pit Bulls on Alison Reder's blog, Sarcastic Dog. The book is called PIT BULL, by Bronwen Dickey. As I started reading it, the book opened with a heart-wrenching story, one I remember all too well. I wish I didn't, but it was all over the news in 2003 and I can't forget it. On the way home from a vacation, a family stopped for gas in Tennessee; a Father, Mother, Son and two dogs. The father mistakenly left his wallet on the roof of the car, money flying out of it as they drove away. Someone called 911 and somewhere along the line police got the impression that a robbery had occurred. Their car was pulled over by police and the entire family forced to get on the ground. They told police they had dogs in the car and begged them not to open the doors or they would run out. The ending of this messed up incident resulted in their beautiful, friendly "Pit Bull/Boxer" mix family dog, Patton, being shot to death by police! The Officer cited that the dog "looked like a Pit Bull" and that he "felt threatened". The entire family was devastated by this senseless tragedy. Bronwen shares a lot of history and information about Pit Bull type dogs. She also does a lot of myth busting about Pit Bulls. She shares that prior to the 1970's, these dogs were a much loved and admired breed. There were many famous and beloved Pit Bulls in movies and television. Anyone remember Petey from the Little Rascals? Did you know that Helen Keller and Teddy Roosevelt both had Pit Bulls? Then there was Pal the Wonder Dog, a Pit Bull who appeared in over 200 movies! Pit Bulls were even used in posters for the U.S. military! 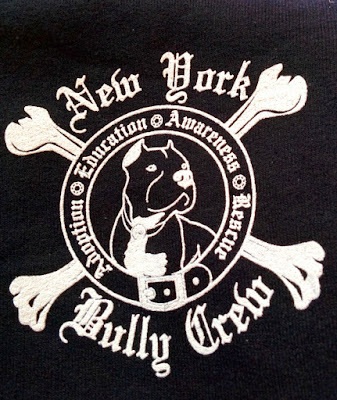 Pit Bulls started being used in dog fighting, which gained popularity in the '70's and 80's in the U.S.. Bad breeding and abusive treatment of these fighting dogs helped to cast them as blood thirsty killers, and they were soon demonized by the media. America's love affair with these majestic dogs had officially ended. Here we are decades later, still trying to reverse the negative stigma on Pit Bull type dogs, a stigma that is not at all deserved. So many people have come to fear all Pit Bull type dogs. It breaks my heart when I hear about cities that have chosen to ban Pit Bull type dogs, and euthanize them in shelters just to appease a terrified public. In my time volunteering at the shelter I met so many wonderful, loving, Pit Bull type dogs that I came to love and defend these dogs. One of my most heartbreaking days as an Adoption Counselor was when a family came in to adopt a dog. They saw a beautiful black dog that looked just like a Labrador Retriever. The family interacted with him and was just crazy about him. I was overjoyed that this beautiful, sweet dog was getting adopted .... until the mother noticed the words "Pit Bull Mix" on the kennel card. "I thought he was a Lab!" she exclaimed. I explained as best I could about the nose to tail point system the shelter used to estimate what a dog's breed was. I told her he was a great dog that could be a mix of anything, including Labrador Retriever. But because she saw those fateful words, Pit. Bull. Mix. she became fearful. She said she was worried for her children and decided Not to adopt him. Despite protests from the kids, the family left the shelter without him. I nearly cried as I stood by this beautiful, sweet dog's cage. If only the Kennel Card had said "Lab Mix" he would have been on his way to a loving new home with kids to play with in a yard of his own. It makes me angry that these wonderful dogs have such a stigma. It makes me angry that many shelters simply label SO many dogs "Pit Bull Mix". It infuriates me that some cities and towns have banned any dog with the words "Pit Bull" in their breed designation. BSL (Breed Specific Legislation) is inhumane, ineffective in reducing dog bites, and simply outrageous. Every dog is an individual and every owner is an individual. There truly are no bad dogs, but there are plenty of bad dog owners! This Pit Bull dog was in the shelter for a long time. I'm not sure if he ever got adopted, but I'm hoping he did. A dog will be vicious if you train him to be vicious. A dog will be fearful if you fail to socialize him by exposing him to people and dogs. A dog will become agitated, frustrated, and likely aggressive if you leave him chained up outside all day and night. What kind of life is that for any living creature?? 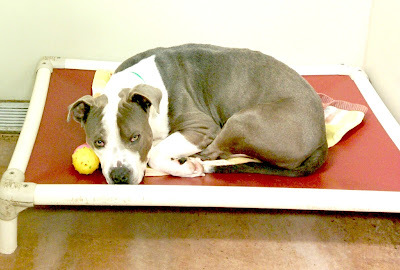 "The ASPCA recognizes that dangerous dogs pose a community problem requiring serious attention. However, in light of the absence of scientific data indicating the efficacy [effectiveness] of breed-specific laws, and the unfair and inhumane targeting of responsible pet guardians and their dogs that inevitably results when these laws are enacted, the ASPCA instead favors effective enforcement of a combination of breed-neutral laws that hold reckless dog guardians accountable for their dogs’ aggressive behavior." "...a peer review study found that nearly 85 percent of dog bite fatalities were from unneutered dogs. Other factors that contributed to bites were abuse or neglect, tethering for long periods of time, and lack of positive interaction with people and other animals." Best Friends also stated that " Some people assume some breeds of dogs are more prone to attacking and biting, though this is a misconception. BSL is often enacted to ease fears over public safety, but these laws are ineffective and very costly"
Oddly enough, I've been reading that Pit Bulls are BOTH one of the most frequently surrendered dog breed types AND one of the most popular breeds to adopt! These two facts seem to contradict each other, don't they? Some experts in the field have hypothesized that due to bias against Pit Bull type dogs, it may be difficult for their owners to find housing that allows Pit Bull type dogs. This could result in Pit Bulls being surrendered. So many landlords (and some Home Owner's Association's too!) have restrictions on the size and breed of dogs they will allow in their rental units, if they allow dogs at all. This beautiful girl has been at the Town Of Hempstead Animal Shelter in Wantagh Long Island, NY since early 2015! I think you'll agree, that is way too long to be waiting for a home with someone to love. 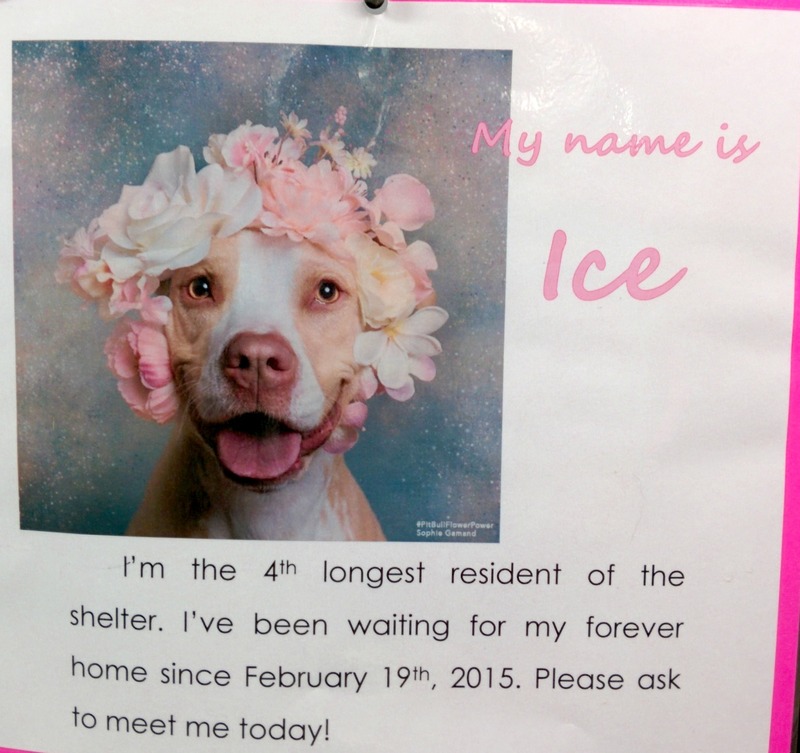 I recently heard that long time shelter resident ICE (pictured above) has been ADOPTED! I am overjoyed that after more than 2 Years in the shelter she has finally found a home! I've been in contact with the shelter to see if I can obtain a little information about her adoption, whether it was an individual or family that adopted her and if they learned about her via social media or as a shelter walk-in. I always like to know what works in terms of finding forever homes for pets in need. If I find out, I'll post the information here. I'd like to thank each and every one of you who shared this blog post. Sharing is Caring, and sharing about adoptable dogs in need of loving homes can make a difference! It's been suggested that higher homeowners insurance costs and the high energy and exercise needs of the breed (probably no different than a Husky's high energy requirements!) may also cause some owners to ultimately surrender their Pit Bull type dogs to a shelter. We can't ignore the fact that many people who adopt Pit Bull type dogs often do so for protection both of themselves personally and protection of their property. When I volunteered in Phoenix, there were quite a few people who said they'd feel safer with a Pit Bull type dog and sought them out for that reason. Many people in the rougher neighborhoods in our city had Pit Bull type dogs they left out in the yard for protection, and cute little Chihuahua's inside the house for companionship. It's not a judgement, it's a fact of life in some of the city neighborhoods our shelter served. A young woman came into the shelter with a friend to adopt a dog one day. I was happy to see her drawn to the Pit Bull type dogs, she seemed to be looking for just that type of dog. She decided to adopt a fabulous, sweet Pit Bull girl. As we finalized the adoption, she turned to her friend and said "No one's gonna mess with me walking down the street with THIS dog!" I was a bit taken back, but she was so nice and affectionate to the dog, and seemed to genuinely like her a lot. I felt she would give her a good home. I assume the woman lived alone, perhaps in a lower socio-economic area. If she didn't, I doubt she would be so concerned about safety in her neighborhood that she'd need what she perceived to be a tough looking dog to feel safe. I have no actual facts to back up my assumptions about the woman, it was just my perception of her. As long as she provided a loving home, that was fine by me. Although dog fighting is illegal in every state in the U.S., it still goes on. Sadly, Pit Bulls are often the fight dog of choice in this illegal and cruel activity. Dog fighting is a horrific form of animal cruelty, with terrible consequences for the dogs, and for the community as well. DOG FIGHTING IS A CRIME!! IF YOU SUSPECT DOG FIGHTING IN YOUR COMMUNITY, PLEASE CONTACT AUTHORITIES IMMEDIATELY. 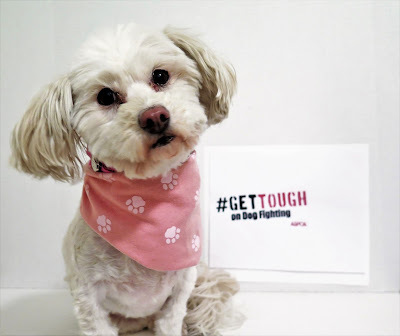 Get Tough on Dog Fighting! DOG FIGHTING DOESN'T JUST HURT DOGS, IT'S LINKED TO ILLEGAL ACTIVITIES SUCH AS DRUG TRAFFICKING. FIND OUT MORE ABOUT HOW DOG FIGHTING HURTS COMMUNITIES. What are your thoughts about Pit Bull type dogs? Have you ever owned or known a Pit Bull? Please leave us a comment and share your thoughts! We love when you bark back! When I first began Barking from the Bayou, I knew that dog fighting was a problem in the south but was stunned and heartbroken to realize what a massive problem that it is in our country. Such a shameful crime. It really is a shameful crime, I'd like to see more crack-downs on dog fighting & animal cruelty in general. I will wear my new sweatshirt with pride! Great post. Many of the dogs at the shelter the mom volunteers at are pitbull mixes. But they all are wonderful dogs. And thanks to the great volunteers, we have had good success with educating the public finding homes for all of them. I am SO delighted to hear that!! Give your mom a big kiss for me & thank her for helping the Pitties at the shelter! Fantastic article and so glad you're calling attention to this horrific injustice. The media doesn't help when they whip readers into a frenzy, yet conveniently never mention the abuse and neglect the poor dog suffered at the hands of abusers. How can people actually believe dogs who look a certain way deserve to die. In this day and age to have BSL and the Dangerous Dogs Act make a blanket ruling against a "look" is outrageous. Not enough can be written about this sad situation, and maybe one day our voices will be heard. Well done Cathy. Thanks so much Hindy, I appreciate your support on this. It is SO upsetting! I really feel strongly that BSL is just Wrong on every level. This is such a great post! My niece's dog is a pitbull mix and I just adore him. Is the sweetest most docile dog you could ever meet. I can't wait for the day where I can own a home because I will definitely adopt a Pitbull from a shelter. Thanks so much for writing about this. Thanks Dawn! I'm so glad you like the post. I've known so many sweet, friendly Pits, it drives me crazy that they've been so demonized. It's so unfair. Your Niece's dog sounds so wonderful, you should blog about him, October is Nat'l Pit Bull Awareness Month you know. This is a great post! Thank you for spreading such valuable information. One thing I will also add is that while it is absolutely true that "a dog will be vicious if he is trained to be vicious" or "fearful if not socialized," it is also true that heredity plays a huge role in the temperament of a dog. All dogs, not just pit bull type dogs. If a breeder selects his breeding stock from only the most aggressive or reactive dogs, the puppies have a greater chance of being reactive. It is my sense that most of the breeding of these dogs is by BYB's and so the hereditary temperament factor cannot be dismissed. I do agree with you that there it is not usually a "bad dog" but rather an idiot bad owner/BYB that is the issue. Thanks Stephanie, I'm glad you liked the post! That is true, if a lousy "breeder" wants to make their puppies aggressive they can do so by selectively breeding the most aggressive parents. That does happen with several dog breeds. Shelters will sometimes take the puppies away from the Mom if she's aggressive so they don't "learn" the aggression from her. I think most puppies can avert the aggression if they're young enough and they're put into a different environment, but sadly that is a valid point. Thank you from the bottom of my heart for writing this post. You nailed it with your heading. Fight the breed discrimination. We do this, too. Thanks so much Carol, that means a lot! BSL and dog fighting are two things that make me crazy!! Both of these things, along with Puppy Mills Must. Be. Stopped. Oh man that poor dog Patton. People can be so STUPID!!!! There is so much ignorance about dogs (and about black cats) I could grab people by the throat and shake them really REALLY hard!!!! I love your pic of the sweatshirt and Icy looking up. It says it all Dogs trust, it is us who do wrong. You're so right, in every thing you say. When that story first broke in '03 I cried my heart out, and I was so angry. Seeing it in this book brought it all back. I love this sweatshirt, I wear it proudly. I wish that more law makers would realize it isn't the breed, but the human next to the dog that needs to be held responsible. My daughter hopes to adopt a Pit bull type dog one day. I don't know many, but the ones I know are super sweet. Absolutely, they are so foolishly making decisions that have caused the death of wonderful family dogs. I've known so many great Pits from the shelter I volunteered at. There are great owners and horrible owners out there. The dogs are a reflection of their owners. I blame the humans 100%! They created any bad environment these dogs were raised in. I often say that it's more of a human problem than a dog problem. People assume all dogs are going to react the same way to a situation. Or all dogs will be fine with a hand shoved in their face. But just like people dogs are different and should not be treated like little pet robots. Every dog is an individual, it's what the owner does with that individual that counts. I fully agree Mishu!! It's awful that insurance rates should even come into play based on a dog's breed, it's ridiculous. I hate that landlords don't like to accept pets, but again I think much of that comes based on experiences with bad owners. As a Landlord myself, I allowed pets, including dogs & cats. I did come across some lousy owners which is a shame. Dog fighting is such a horrible crime and BSK seems very unjust. I too have met lots of lovely loving Pit Bulls. Any breed can be aggressive- I read that the most bites come from smaller breeds like JRTs, Chis etc. I guess they can't do as much damage and do not look as fierce so the Pit Bulls get the coverage. It really is a horrific crime, and the worst form of animal cruelty. You're right, any breed can be aggressive and BSL is completely unjust. It's ineffective too. Small dogs often bite out of fear I think. Also, people get right in their face because they're small and seem non-threatening. GASP!! That is SO awful & cruel! That poor little girl, she must have been devastated and probably scarred for life. I'm glad your Twitter friend turned an awful incident into a positive life goal. My girl is some Staffie in her, and she is a rescue. She was clearly loved in her old home because she was well socialized and not fearful from the get-go. Yet some people still get frightened when they see her. I try not to get defensive when people make ignorant comments about pits but instead try to point out realities (No, jaws can't "lock"). It is frustrating when people perpetuate myths about these dogs like the whole "jaw locking" bogus myth. I hate hearing insensitive and false comments about Pit Bull type dogs too, it gets exhausting trying to correct people! What a great post, Cathy! I still want to read that book and I admit I haven't yet. What a heartbreaking story about Patton. It seems like we always need a dog to fear, blame, etc. In the 80's and 90's, dobermans were vilified and in the 60's and 70's it was German Shepherds. You have motivated me to read this book. It's been on my list since Alison first wrote her post. Thanks for the compliment Kristin, that means a lot coming from such a great writer! That story is so haunting, what a senseless death of a beautiful family pet. A real tragedy. It's so true, the media insists that we demonize some breed of dog, the Pits have just gotten way too much of their fair share of it. It's disgraceful. This is a wonderful post. I admit to being "fearful" or cautious about pit bull type breeds. I'm also cautious with German Shepherds, Dobermans, and other dogs who've been bred in the past to attack or protect. I've since learned that even the playful Golden Retriever is known to bite. I hate people assume just because a dog is a certain breed that they can't be a great companion and family pet. Thank you Paula, I'm so glad you like it! It's not the breed, it's how you train them. Any dog can be a guard dog or learn to fight if you make them that way. It isn't very sad how pit bulls are discriminated against. One of my best friends advocates a lot for pitties, and fosters for a pit bull rescue. She has 3 of them herself. They are wonderful dogs! Thanks for raising awareness and educating about this issue. I'm grateful to you friend for her advocacy. I wish I could adopt more dogs, but it's not in the cards right now. I'd love to adopt a rescue Pit Bull. I kind of wish they would just do away with the term "pit bull" since it really isn't a specific breed, and it can be off-putting to so many people. Me too!! It really has such a stigma and isn't the best description as no breed called "Pit Bull" actually exists. You're spot on, Janet, ANY dog can be aggressive if they are trained to be or if you isolate them too much & they become fearful or highly territorial.